User experience follows suit with advances in technology. In the computer era, UX was limited to interacting with a keyboard and mouse. But as technology becomes more sophisticated, user experience has incorporated touch and sound, with virtual reality lurking on the horizon. Because of the often astounding outcomes of digital design, people often overlook the real business boons that design brings about. UX design has claimed more of a central role in commercial activity. According to the DMI Design Value Index, “over the last 10 years design-led companies have maintained significant stock market advantage, outperforming the S&P by an extraordinary 228%.” As design’s business value has grown, its definition has also evolved. There is confusion about what exactly design is. It can just mean a pattern, the end artifact. That's where a lot of businesses struggle: "Isn't that just about making something pretty?" It's actually a lot more than that. Good design is as simple as this: Is what has been designed doing what it's supposed to do? How well is it actually performing its specific function or end? And, from a business standpoint, is it profitable to implement this design strategy? If you think about design as a solution to a problem or opportunity, whatever solution you come up with that's the design for it. 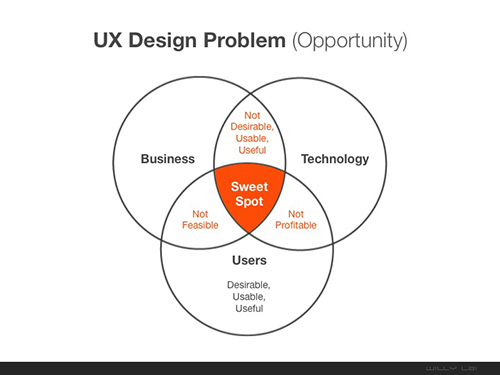 Willy Lai, a leading UX designer and instructor in the upcoming course User Experience Design Fundamentals, recently spoke at SF Design Week on strategic UX design, and shared an illuminating slide on the intersection between business, technology and users. Lai led user experience design for the most recognized companies in technology, including Samsung and PayPal. He stressed that UX designers who target that concurrence between what is useful, feasible and profitable can most effectively leverage their designs. User interface (UI) and UX have become part of the design as a whole, and the profession has taken on a larger role because companies have realized that design has great value in competitive environments. It can help one company differentiate one product from another. When users can easily click away from a particular product or company and find a reasonable alternative, that user is going to go someplace else if a product has bad UX. A well-designed product becomes a much more strategic advantage for a company that must be successful in this competitive, global environment. With many firms jostling for attention, eyeballs and dollars, businesses that continue to grow have done so, in part, because of great UX design. When a company realizes that, "Hey, design is nice, but it's also really good for our business," that's when it clicks—it becomes part of the company’s culture as a contributing factor to great customer service. The companies that figure out how to harness design are often the ones that are reaping the benefits and truly succeeding. They're paving the way for those companies that either don't know, don't know yet or are trying to get there. If you can influence a user's thoughts, behaviors and feelings, that’s a big value add for any business. The importance of UX design has, of course, been bolstered by the rising importance of the Internet in people’s interactions with the products they use every day. In the past 10 years, Internet sales have nearly tripled as a percentage of total sales, from 3% in 2006 to more than 8% by the first quarter of this year (U.S. Census Bureau News, August 2016). That growth rate is one of the main drivers behind UC Berkeley’s new Professional Program in UX Design, which is training designer’s for jobs in the Internet economy. We talked in depth with Willy Lai both in the preparation of the new program and while writing this article. He underlined the value of design in a world where customers are turning more and more to the Internet for information and goods. “If you can influence a user's thoughts, behaviors and feelings, that’s a big value add for any business,” Lai says. Therefore, it’s important to bring in the user early and often to create a truly user-centered design. Companies go so far as including their users throughout the entire product-development process. Put your initial designs in front of focus groups early to ensure that you’re on the right track. Getting constant user feedback is a logical and reliable way of developing a product that is intuitive for end-users. There is a risk, however, in designing to solve the wrong problem. Sometimes teams and individuals present a problem that's really more of a prescribed solution. This is where a designer needs to be proactive and decipher which is which. If you're going to be measured by coming up with the right solution to the right problem, then part of your job is to ensure that you're solving the right problem. Once again, Willy Lai helped to clarify the thinking around this issue with a quadrant that shows the decision making permutations that often happen during the design process. It may be that the person who's conveying the problem isn't trained or articulate enough to convey the problem. If someone says, “We need a new nav bar,” that’s a prescribed solution to an undefined problem. You have to dig to understand why they suggested that. Designers need to wrap their heads around what a business does and what it's trying to do, and that becomes the backdrop or context for solving the problems they're tasked with. As much as they're solving user problems, they're solving business problems, too. It should be part of a designer's tool set to be able to decipher, analyze and identify the right problem. Building that skill set requires education and training, but that effort could pay off in a highly paid and rewarding career in a growing field. The Bureau of Labor Statistics is bullish on both Web development and graphic design, two specialties that feed into the more targeted career as a UX designer. You can further explore the key concepts of UX design, and learn strategies to develop your own UX career in Lai’s upcoming one-day course on Nov. 5, User Experience Design Fundamentals, that uses lectures, discussion and hands-on exercises to give you a solid grounding in this growing field. Learn more about the Professional Program in User Experience Design.